I’ve got a lot of photos to post, I’ll have to go back and add some to previous posts. 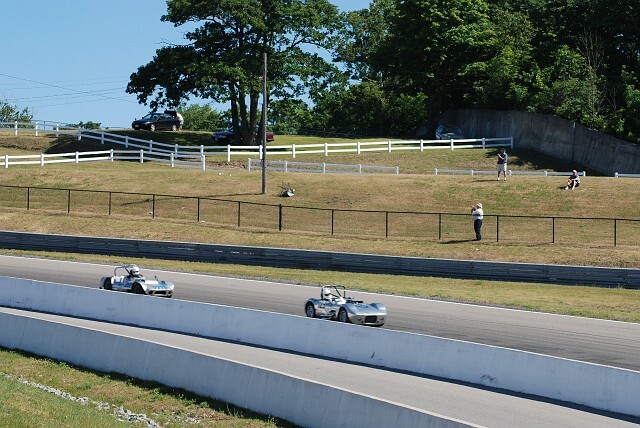 Mosport went just about as I thought it might. The relatively small field of sports racers whittled down a bit through mechanical attrition and wall-related modifications. I finished the feature race in eighth overall, third in my class, which was also dead last overall, and dead last in my class. Humbling, but not as humbling as leaving with a crunched or toasted car, as many in the group did. I got my times down to 1:40:something which is pretty good. It would have been good enough to win either of the production car classes, which is where I sometimes fit better. Lola T70’s and even Lotus 23C’s are not very rational competition for a TR3 in drag. On the other hand, I did have someone to race with, and that wouldn’t have happened in the production classes, so I should quit whining and admit the organizers picked the right place to stick Peyote. Still, I’m not used to being lapped by the race leaders. Peyote didn’t like it at all. I think it blames me. Hell of a nerve it’s got–I think it could have shown a bit more top speed. I also got to race with the Filson Falcon, which I’ve heard about many times over the years. It looks like Peyote’s slightly more shapely brother, and the owner drives the wheels off it, so it was fun battling with him. He had a bit more power–but not much, Peyote had a bit better handling–but not much. Did I mention that this is a really tough track? I can’t think of any other track that I used my transmission and brakes so little. One brief excursion to second (turn five), one downshift to third (turn 9), one hard braking point (turn five) two brake “brushes” turn two and four. That’s it. Otherwise, it’s fourth gear, stand on it, and turn in VERY precisely. Did I mention that in turn two you need two hands to hold your cojones, leaving none to steer? Did I mention how I sat in the car for a few minutes every time I got back to the paddock? Just needed a little time for reflection and meditation. Nothing dramatic, I’m not going to become a monk or anything. On the other hand I might become a nicer, more caring person. I really enjoy your posts — what a summer! Rained hard here Sunday. Today it is in the eighties. Sad I am only watching this weekend at the Historics. Hope they will let me in to do the Columbia Classic since I will have done 5 ICSSC novice/area races by then so should not be considered a pure “novice”. Course that only works if the TR5 hodls up.